Plentiful winter rains followed by a mild start to spring is resulting in what naturalists call a “superbloom” throughout Southern California’s desert landscapes. 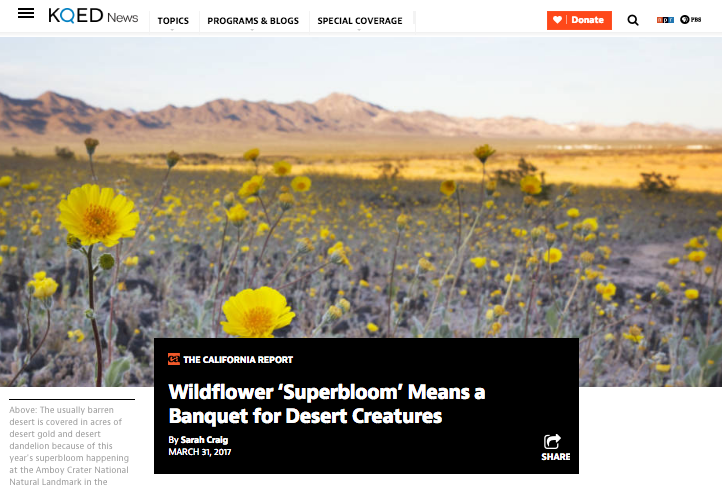 Wildflower enthusiasts can’t get enough of the vibrant colors, and tourists are flocking to the deserts. Meanwhile, creeping out from their underground middens or swooping in during the darkest hours, desert critters are feasting. Listen here or read the full story at KQED.org. Aired in March 2017. Sarah Craig is a documentary photographer and radio journalist based in Oakland, CA.